Direct-to-Disc Recording - Some History and It's Future. As I’ve mentioned in previous blog posts, I was exposed to a wide variety of audiophile music in my teens thanks to my older brother. He had a nice Thorens turntable, SAE amps and massive custom built speakers. A couple of the albums in his collection still stand out: Rough Trade Live and Rob McConnell and the Boss Brass Big Band Jazz. These were both direct-to-disc audiophile recordings released on the Umbrella label. Rough Trade’s was a 1977 release while the Boss Brass was released the following year. It’s interesting to note that Rough Trade’s release was their first album and the first rock album to be recorded direct-to-disc. Given the challenges of direct-to-disc recording, that’s a pretty ambitious project for a new band . The Umbrella label was the direct-to-disc sister label of Toronto based Nimbus 9. Another side-note here (music history is so interconnected it is difficult to keep a single story line) – Nimbus 9’s claim to fame was buying out the contractual obligations of The Gùess Who to Quality Records for a whopping $1,000. The first Guess Who release was Wheatfield Soul which lead off with These Eyes which eventually sold one million copies in the US.market. But The Guess Who never released a direct-to-disc album and that’s really what this blog post is supposed to be about. 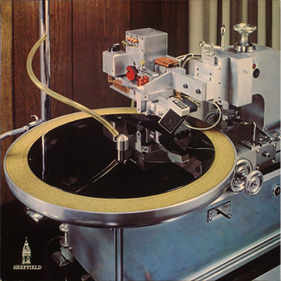 As it sounds, direct-to-disc is a recording process that directly records to a vinyl-disc cutting lathe without using any tape recording while the musicians are playing live – no tape or digital masters. In the 70’s at the peak of direct-to-disc recording, digital recording was in it’s infancy and not yet ready for quality audio recording. The standard analogue process involved four layers of recording to magnetic tape. During direct-to-disc sessions, the musicians would play an entire album side uninterrupted and without the aid of any correction. Album sides were usually 15 minutes in length. The theory was that removing the intermediary magnetic tapes eliminated the inevitable degradation in sound quality for each transfer of recording from tape to tape. It is difficult to argue with this theory and most audiophiles who have been able to do a sound comparison would atest to the superior quality of direct-to-disc recordings. With the right access such comparisons are possible as most direct-to-disc sessions were also recorded to tape as a back up. Taping sessions also allowed for future tape to master releases at a later date as the pressing from the direct-to-disc masters was limited by the inevitable wearing of these masters. Of course, prior to the advent of magnetic tape recording in the nineteen twenties all audio recording was done directly to the playback medium. By 1948, with the birth of the LP album, all audio recording migrated to magnetic tape masters. Another nuance of direct-to-disc recording, some claim, is the performance quality brought on by the fact that the musicians know they have a single opportunity to flawlessly present an entire side of an LP. Some believe they can hear a heightened energy in direct-to-disc performances. Capsule Labs recording studio in LA provides direct-to-disc recording and seems to be capitalizing on the live performance of direct-to-disc sessions. They promote this as an experience where the session is videoed and can be an intimate event to be part of a unique live performance. Currently there are eight studios worldwide offering direct-to-disc service – five in the US, one each in the UK, Switzerland and Germany. It’s difficult to determine how many direct-to-disc albums are released annually, but with only eight studios with this capability the number must be relatively low. It you’re interested in further reading, check out this article about the Audio Engineering Society setting up a direct-to-disc recording session at their 2001 convention in New York City. Also worthwhile reading is Robert Auld’s article on the evolution of recording engineering.